When Kelli Kamida graduates from Mark Keppel High this June, don’t be surprised if a huge bouquet of flowers arrives from the Montebello Oilers. It will be easy to understand if they’re happy to see her move on. 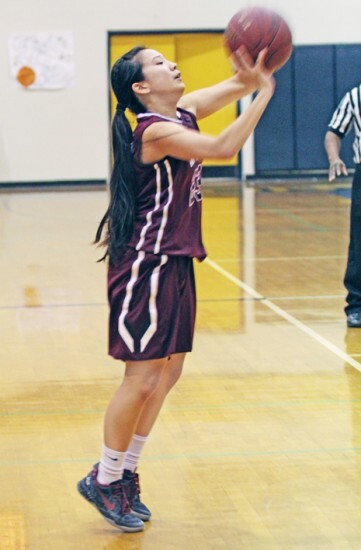 On Friday, Kamida nearly matched her own state record for three-pointers in a single game, connecting for 14 long balls in Keppel’s 90-36 runaway at Montebello. And she did it without playing at all in the fourth quarter. Keppel head coach Joe Kikuchi said Kamida had already racked up 12 of her three-pointers by halftime, and he didn’t want to needlessly run up the score. Kamida’s feat came nearly a year to the day that she set the CIF mark with 16 from behind the arc, last Jan. 29 – at Montebello. Kamida finished with 42 points for the night, all coming via the three-point basket. In a game against Montebello last month, Kamida had three 3-pointers in just a few minutes of play in a 70-18 win for Keppel. Kamida made quite an impression last year when she came up from JV to assist the injury-depleted Lady Aztecs. She made the most of her opportunity by hitting 16 three-pointers in a 90-50 victory over the Oilers. Her performance broke the state record of 14 long shots in a game, set in 1992 by Danielle Viglione of Del Campo High in Fair Oaks. The previous CIF Southern Section record of 13 was set in 1994 by Sarah Hagman of Crescenta Valley.